Hopscotch is primarily an outdoor nursery. 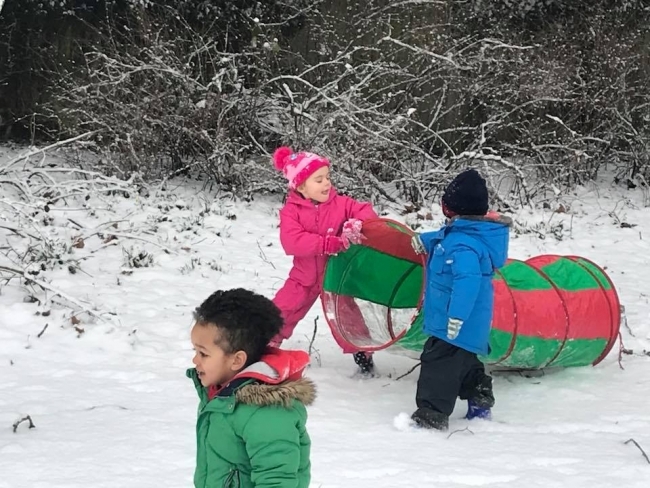 We let our children decide where they would like to play and learn and the majority are usually to be found in our amazing garden - even in the winter! Of course they are suitably dressed in this case as we provide all in one puddlesuits for them to use and keep them warm when they are outside in the colder months. Our garden was designed by the amazing lady who created both the Gruffalo Trail and Stick Man Trail at Brentwood's Thorndon and South Weald Parks. 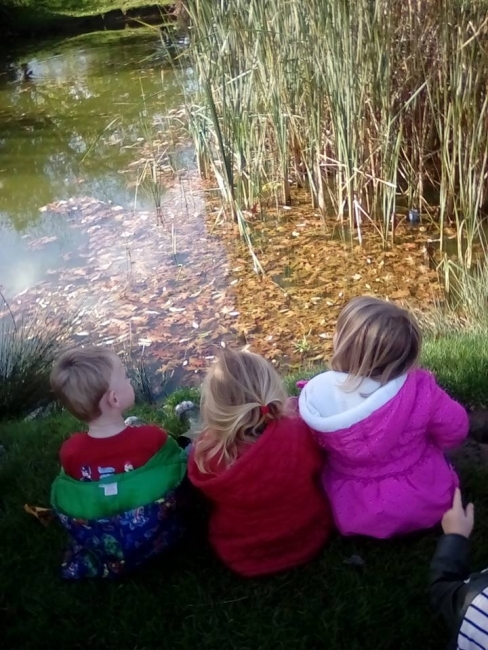 There has been a lot of research carried out which has identified that children are not spending enough time in the outdoor environment which is why we have decided to make sure that while they are at nursery, they are given the opportunity to be outside as much as they like. We always have staff on hand to allow the children to choose whether to be outside or inside. 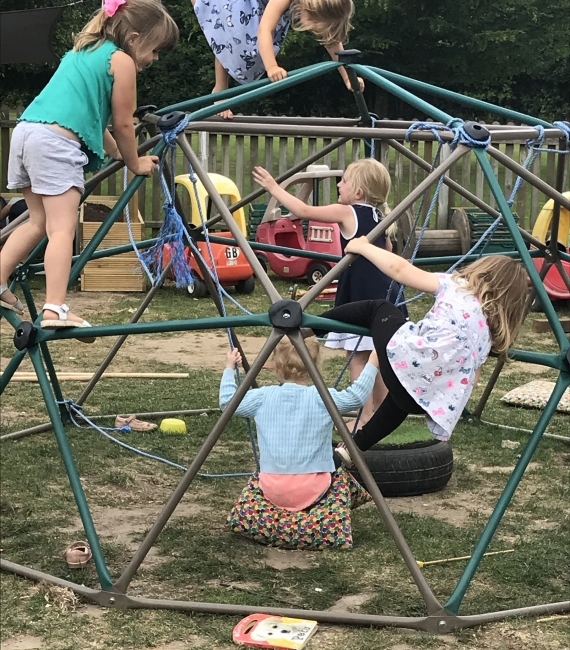 Our garden allows the children to play freely with which ever resources they choose - the climbing frame to develope confidence in grip and climbing skills (and this is not just for the boys!) They can make different configurations with the planks and climbing frames and ladders, tyres, crates, pallets and cable reels. They are encouraged to be creative and let their minds imagine things they wouldn't be able to if thery were elsewhere. We empower our childen to give it a go and if they fall over or fail at the first attempt, we encourage resilience and get them to try again, and again uintil they succeed at what it is they were trying to do. The Caterpillar room is for babies from three months to two years and in this room we look after six children. Chelsea is the head of our baby room and has many years of childcare experience. She is currently working towards her level five degree and loves working with the babies. The staff ratio in this room is 1:3 and the children are looked after by full-time qualified staff who are also well supported by a team of qualified part time staff. Each of our rooms are self-contained with their own kitchen area, sleeping and nappy changing facilities. We are very experienced in looking after babies of this age group and understand that not all babies have the same routine - they will all want to eat, sleep, play and have cuddles at different times. During your settling in visits we will discuss baby's individual routine with you which we will follow once they start at nursery. As and when the routine changes then we change our routine too so baby is always happy. The Caterpillar room offers a stimulating and safe environment for your child to grow, explore and thrive. We have lots of age related toys and equipment with soft toys and cushions to use and play with. We offer lots of activities including messy play, sensory activities, holistic play, singing and lots of opportunities for cuddles! There are many visual aids and age appropriate music with wall displays for all the children's beautiful artwork! Until baby is 12 months old we ask parents to supply all food and milk. At 12 months we can supply meals and snacks if required although we still ask that formula milk and lunch is supplied by parents/carers. Each child has their own cot, blankets and sheets, and as we know baby's individual routine before they even start at nursery, we can be fully prepared for sleep routines. Any changes to sleep patterns will be discussed with parents as necessary.. The Nursery supplies all nappies and creams. In our Butterflies room eight children between two and three years are looked after by two qualified and experienced staff with support from our experienced part-time team. The time table of activities in this room offers a varied and stimulating experience for all the children with plenty of opportunity for children's free choice of play and activities. Children start to work on recognising numbers, shapes and continue their mark making skills. Wherever possible we use the garden every day - even in the winter wearing our puddlesuits and wellies of course! We supply a selection of cereals and toast for breakfast upon arrival at the nursery and a healthy snack is provided mid-morning. All packed lunches are brought in from home. If your child is staying all day at nursery then tea is provided at 3.30. Milk and water are offered at each mealtime and water is available at all other times. Until your child starts potty training then all nappies and creams continue to be supplied by the Nursery. Whilst in this room most children will start potty training. We keep in constant communication with you about all stages of this and will discuss with you the routine at home in order to be continuous and consistent in our approach. There is an opportunity for rest time where your child can have a nap in a safe and comfortable environment if necessary. The Rainbows room is for children from three years through rising fives and in this room we look after up to 21 children. The staff ratio in this room is 1:8 and the children are looked after and cared for by three members. We offer a very varied schedule of activities, learning opportunities and free play in accordance with the EYFS. 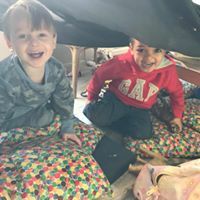 There are plenty of activities encouraging social interaction with a home corner, lots of messy play, cooking, sensory toys plus lots more to help your child explore and experience. The children have many opportunities to learn new basic skills such as mark making and phonics. Every day the garden is available for the children to use and explore. For children arriving before 8.30 we supply a choice of cereals and toast for breakfast. Healthy snacks are provided mid morning. If your child is at the Nursery for lunchtime, you will need to bring a packed meal for them. We can provide an emergency lunch if necessary! A light tea is provided for all children staying after 3.30. Milk and water are offered to all children at each mealtime, and fresh water is available throughout the day. Hopscotch is set in a beautiful location with every room having access to the outdoor environment. The garden is an extension of the classroom which we use all year round weather permitting. We have an all weather safety floor surface and a variety of bikes, trikes, slides, climbing frames, playhouses and sheds available for the children to play in and with. The garden offers a safe environment for all the children to play and is securely fenced with security lighting, which are all checked and regularly risk assessed. 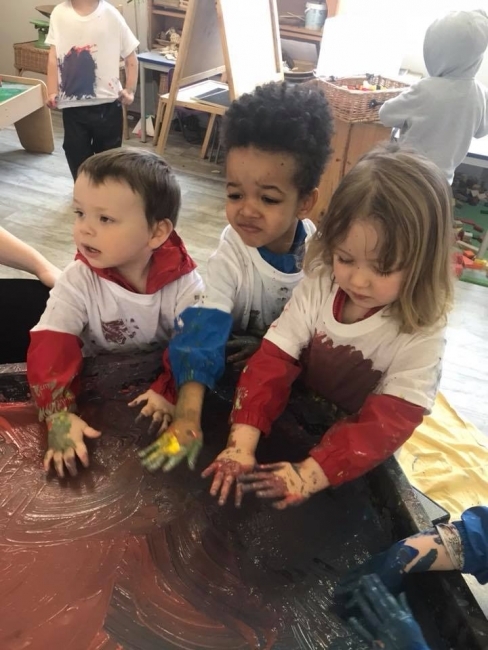 The nursery provides coveralls for the children to use when outdoors but the children will be encouraged to explore the outdoors in all aspects which sometimes results in them getting muddy! !